Wow! That boom looks like it is really up there. I am sure however the position of the camera adds to the effect. Never the less, it is still a high boom. And the angle of the boom is quite severe so the height increases drastically as the boom is extended. But the boom height is only part of the deal. The other part is the seat height. Comparing the seat height with the boom height is more critical than just looking at the boom height alone. Most tadpole trikes typically have about a 14 to 16 inch boom height. Of course, the angle of the boom as it extends out greatly effects the actual height. A boom with little angle to it won’t change the height much as the boom is extended out. However, a boom that has a pretty steep angle will greatly add height to the boom as it is extended out. I know I have repeated myself a bit here. I have often wondered why some trikes are made with such severe boom angles since this extreme height gain is the result. I would think that would be very undesirable. Does all of this matter? Well, that depends. It depends upon the rider. Some people have no problem with the boom height way up above the seat height while others have a big problem with it. When talking about the height of the pedals, boom, crankset, etc. 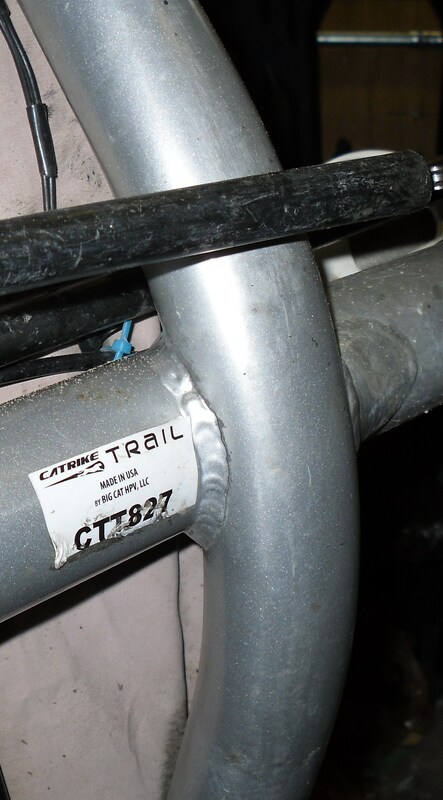 the term “bottom bracket” (BB) is used. 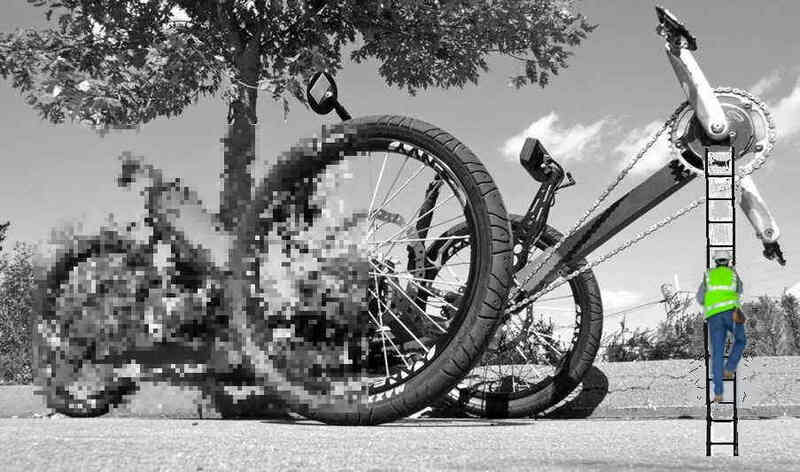 By definition: “The bottom bracket is the part of the bike that connects the crankset to the bicycle frame and allows the crankset (made up of pedals, crank arms and chain rings) to rotate freely.” Of course, that definition is for a bicycle. 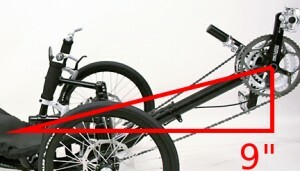 However it is basically the same for recumbents … just in a different position. In the image below I have placed a white with blue dot in the center of the bottom bracket and attempted to illustrate the BB measurement from the ground up to the center of the bottom bracket. The red arrow shows the BB measurement. The green arrow shows the seat height measurement. The purple line shows the difference between those two. As you can see in the picture below I have drawn red lines which show the seat height vs. BB height. The light blue line shows the angle of the boom. The Performer trike on the left side has a steep boom angle and the pedals are quite a ways up above the “common” seat height. The TerraTrike Rover trike on the right side has a fairly level boom with a very high seat so the pedals are down low below the seat. 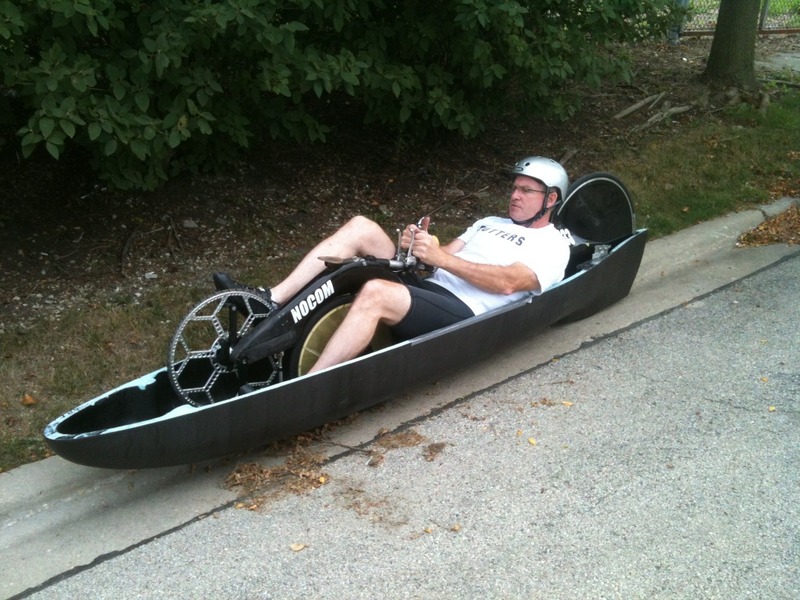 That is quite unusual for a recumbent tadpole trike. It is an individual choice as well as possible need to choose the setup on the right. I am not sure what that need involves. I am thinking it is more psychological than anything. I could be wrong though. As for me, I would choose the one on the left. I say that because I don’t have the “need” of the other arrangement. And the arrangement on the right means that performance, handling, comfort and some aspects of safety suffer … things that a tadpole trike are known for. I would not want to give those up if I didn’t have to. The bottom line here is that some folks just prefer one over the other. I just mentioned “comfort” in the above paragraph. I want to touch on this. 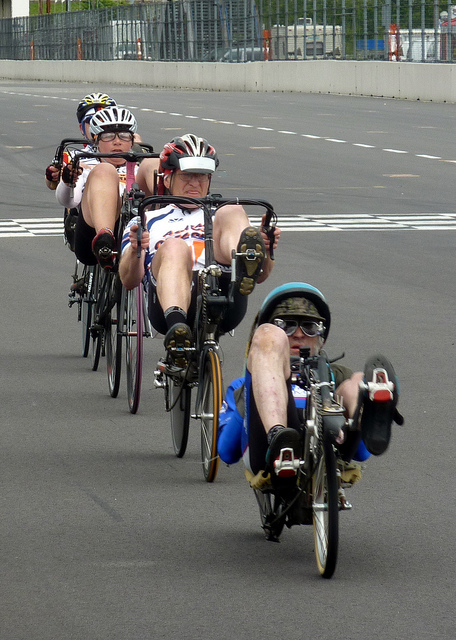 Before I started riding tadpole trikes I rode recumbent bicycles. I had two recumbent bicycles and both of them had the bottom bracket down low. For awhile I had both my bike and my trike. When I would go from riding my trike to riding my bike I noticed that the bike was not nearly as comfortable to ride as the trike is. (I also noticed that it wasn’t nearly as much fun to ride as my trike is.) It was a no-brainer … the trike wins! And so because my bike just sat around I eventually came to the decision that I might as well sell it. I dood it and don’t miss it at all. So for me the bottom bracket position made a big difference in comfort. The higher position of my trike got my vote. There is one trike model that I want to point out. It is the well known Catrike 700. 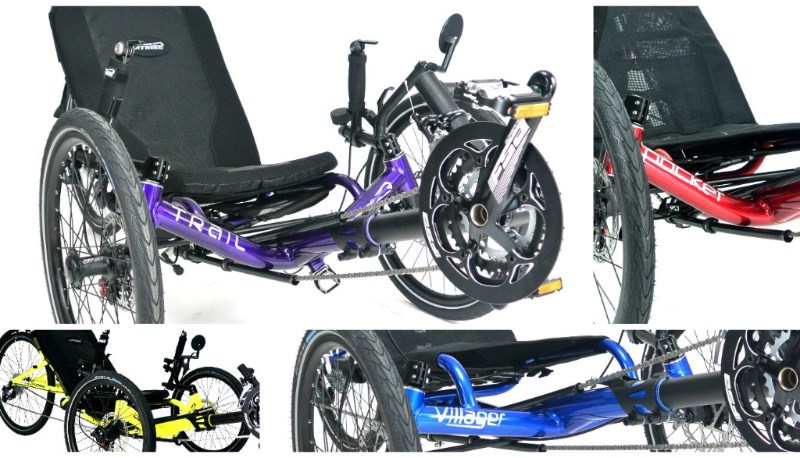 The pedals on it are considerably higher in comparison to the seat height than other Catrike models as well as other manufacturer models. The seat height is 8.5 inches and the BB is 17.5 inches. That is 9 inches higher. 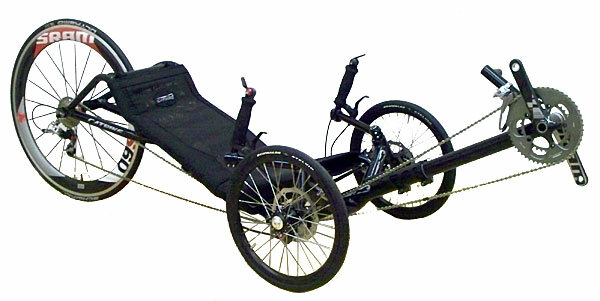 Compare that with the Catrike Expedition which has a 10 inch seat height and a 16.5 inch BB height. That is a 6.5 inch difference between the seat and the BB. So there is 2.5 inches of difference between the two models. That may not sound like all that much, but you just might be quite surprised at the difference it can make. Just for comparison, two similar trikes, the CarbonTrike Race tadpole trike has a BB of 15.7 inches and a seat height of 7.9 inches. That is 7.8 inches difference. The ICE VTX has a boom height of 15.9 inches when fully extended and a seat height of 6.5 inches. So that is a range of 5.19 to 9.09 inches of difference. One thing to keep in mind for those who do a lot of hill climbing … when the trike is actually climbing a hill the BB will become even higher in relation to the seat height. That can be a problem for some people. I will only mention here that this matter of seat vs. BB height also significantly effects the power and efficiency of pedaling. You won’t see recumbent bikes and trikes which are known to be fast with one’s legs down low. They are always up fairly high.